*If you’ve any concerns for your son/daughter the following supports are available* Your local GP service or Emergency Depts. in Waterford or South Tipperary, Pieta House in Tipperary or Waterford (Tel. 1800247247). Your local youth services, Foróige and The Edge Project may also be available for advice/support. Our annual open night will be on the 30th of November 2017 at 6pm . Looking forward to welcoming perspective students to our school. 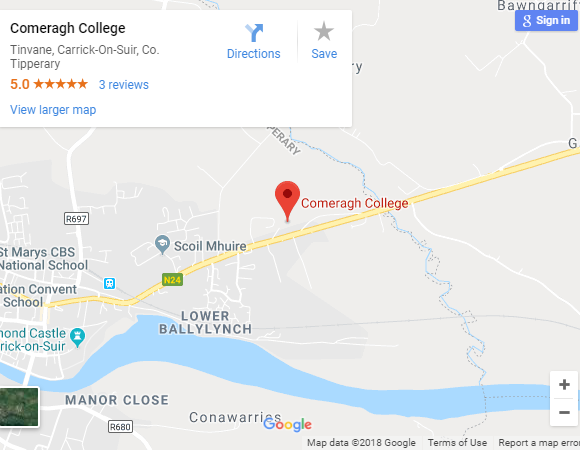 A College Fair will be on in Comeragh College on Wednesday 22nd November with lots of colleges attending including IT Carlow, Kildalton College, Limerick IT, Maynooth University, Ormonde College, Tipperary Education and Training Board, WCFE and WIT. Our senior football team who defeated Clonmel CTI/ Gael colaiste in Munster senior football championship on Friday 10th November 2017. Also the first team from Comeragh College to win a competitive match on our new pitch since we opened it. Well done lads! !